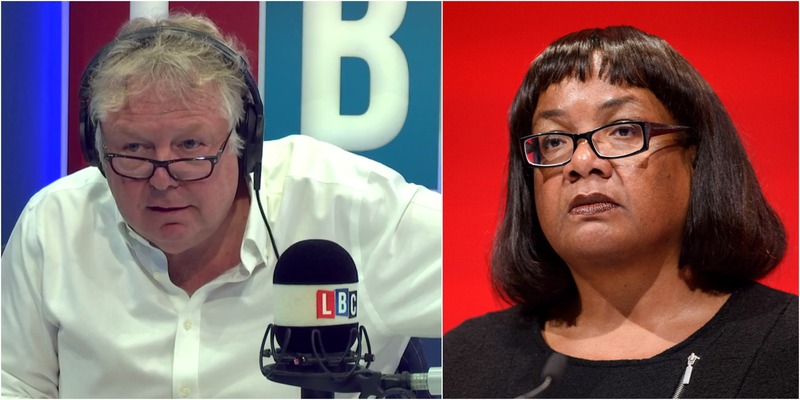 This is Nick Ferrari's car-crash interview with Diane Abbott, in which she simply didn't know how much Labour's policy to add 10,000 more police officers would cost. The Shadow Home Secretary was speaking to Nick Ferrari to announce Labour's new plan for police and crime ahead of the General Election. And at one point, she claimed that the policy would cost £300,000 - the equivalent of £30 per police officer. When asked how much the policy would cost, Ms Abbott said: "Well, erm... if we recruit the 10,000 policemen and women over a four-year period, we believe it will be about £300,000." Nick queried the amount: "£300,000 for 10,000 police officers? What are you paying them?" Ms Abbott tried to clarify: "Haha, no. I mean... sorry. They will cost... they will, it will cost, erm, about... about £80million." Again Nick asked how she got to that figure, explaining that it would mean paying the police officers an annual salary of £8,000. Ms Abbott said: "We get to that figure because we anticipate recruiting 25,000 extra police officers a year at least over a period of four years and we're looking at what average police wages are generally, but also specifically police wages in London." Despite struggling with how much the policy would cost, Ms Abbott insisted the plan was fully-costed and fully-thought-through, paid for by reversing the Conservative cuts to Capital Gains Tax. Nick Ferrari: So how much would 10,000 police officers cost? Diane Abbott: Well, erm... if we recruit the 10,000 police men and women over a four-year period, we believe it'll be about £300,000. Nick Ferrari: £300,000 for 10,000 police officers? What are you paying them? Nick Ferrari: How much will they cost? Diane Abbott: They will cost... they will, it will cost, erm, about... about £80million. Nick Ferrari: About £80million? How do you get to that figure? Diane Abbott: We get to that figure because we anticipate recruiting 25,000 extra police officers a year at least, over a period of four years and we're looking at both what average police wages are generally, but also specifically police wages in London. Nick Ferrari: And this will be funded by the reversing in some instances I think the cuts to Capital Gains Tax, but I'm right in saying that since Jeremy Corbyn became the leader of the party, that money has also been promised to reverse spending cuts in education, spending cuts in arts, spending cuts in sports. The Conservatives will say you've spent this money already Diane Abbott. Diane Abbott: Well, the Conservatives would say that. We've not promised the money to any area. We've just pointed out that the cuts in Capital Gains Tax will cost the taxpayer over £2billion and there are better ways of spending that money. But as we roll out our manifesto process, we are specifically saying how we will fund specific proposals and this morning I'm saying to you that we will fund the 10,000 extra police officers by using some, not all, but just some of the over £2billion. Nick Ferrari: The £80million is the figure we used. Nick Ferrari: But I don't understand., if you divide 80million by 10,000, you get 8,000. Is that what you're going to pay these policemen and women? Diane Abbott: No, we're talking about, erm, a process over four years. Nick Ferrari: I don't understand, what is he or she getting? 80million divided by 10,000 equals 8,000. What are these police officers going to be paid? Nick Ferrari: Has this been thought through? Diane Abbott: Of course it's been thought through. Nick Ferrari: Where are the figures? Diane Abbott: The figures are that the additional costs in year one when we anticipate recruiting about 250,000 policemen will be £64.3million. Nick Ferrari: So you're getting more than 10,000? You're recruiting 250,000? Diane Abbott: No, we are recruiting 2,000 and perhaps 250. Nick Ferrari: So where did 250,000 come from? Diane Abbott: I think you said that, not me. Nick Ferrari: No, no, I can assure you you said that figure because I wrote it down. Diane Abbott: What I'm saying about the costs is in year one, obviously, we're getting ready to recruit. But in year two, the cost will be £64.3million. In year three, the cost will be a £139.1million, year four, the cost will be £217million and year five, the cost will be £298million. And that can be amply covered by reversing the cuts to Capital Gains Tax.